I'm not tall. You might say I'm short. I make terrible, terrifyingly-bad coffee. I named my childhood dog after a chocolate bar. His identification tag is on my keychain. At one brief time in my life, I played tambourine in a band. I am clumsy. I scar easily. I've got me some souvenirs. There's a constellation of burns at the inside of my wrist collected from splattering oil. I have a pair of lines across one of my forearms, branded on separate occasions by a scorching oven rack and a searing baking sheet, respectively. I wonder at how many times I knocked my noggin or shin on the wheelhouse steps on one of my father's ships. There's the mark where my knife skipped on the board and caught my finger. I've got a skinny red line that rests on my collarbone as a necklace, and a number of freckle-ish spots by my ankles from falling over sticks and rocks. On the side of my left knee, raised and pale, there's a scar that is maybe three inches long. It is wider at the top and tapers to a point at the end. Last summer, when someone asked me how it happened, I tripped on my words. It's a mark I've had on me for the majority of my life, three-quarters of it at least, yet I've long discarded its circumstance. I don't remember if I cried, or who patched up the wound, or if I needed stitches. I don't think I did. I have a hazy recollection that I cut myself on an air conditioner as a kid? Yes, maybe on the air conditioner, the one between our house and that of our neighbours. I can tell you the siding was white on our house and pale, sunny yellow on theirs. There was gravel between them, and I can still hear how sounded under our feet. I remember what summer was like back then. I remember the important things. My mother grew the best roses on the street — big, heavy blooms the size of baseballs. My father would buy ice cream in those rectangular boxes, then break the carton open and pull back the sides, so ice cream stood as a block in the centre. He'd use a carving knife to slice off pieces thick like steaks. I remember melon balls cold from the fridge, and popcorn from the big orange popper we had, and the thermos that was always filled with hot, hot milk tea for long car rides. I remember jumping the fence because we couldn't reach the latch to the backyard, and the cluster of trees we used as a hideout. I remember my parents had pool parties that lasted into the night, when we'd be allowed to stay up past dark. We'd even get Coke to drink. I'd swallow it fast, the bubbles tight in my throat. The adults sat at a round table close to the gate, while all us kids were in the water. The chlorine stung my eyes; when I looked at the lanterns tucked around the garden, the light shone with blue halos. I remember riding our bicycles down to the lake, trying to keep up with my big brother, going to watch the fireworks on Canada Day. Standing there breathless, sweaty, still straddling the bike seats, leaning forward on our handle bars and chewing gum. We were due home as soon as the last sparkles burned out in the black of the sky, when we were left with stars. I am, sometimes acutely, aware that my children are now the same age I was in some of those memories of mine. It is the leading edge of summer; there's already been fun fairs and field trips, and cubbies to clean out, and day-before-yesterday, the last day of school. We're at the brink of a place deep with possibility. I've decided to pack for the leap, with a supply of strawberry limeade ice pops. Some for the boys, and some for us adults, made prickly with the bitter of Campari. These flavours pull very much from those years ago. Strawberries grew on the side of that white house, right beside mint. When Sean and I moved to where we live now we planted some along the side of this house, because summer has to have strawberries. And it's the season to go for the gusto with lime. I was the kid that dug for the lemon-lime or lime popsicles from the freezer at the corner store, diving waist-deep through the sliding cooler top to search. If I thought I had the right one, I would hold the package up to the shop window to make sure it was tinged truly green, and not the deceiving, disappointing, yellow of banana. The mouth-watering pucker of lime also recalls nimbu pani, the salty-sweet limeade we'd have in India. For these ice pops, the fruit is blitzed with a pour of honey to a sharply fragrant purée, and goes first into the mould. There's a specific strategy to the design; eating the bright berries first, with the tongue-tingling acidity of the lime, is like the spark that lights a fuse. Without fat or too much sugar, the flavour is icily intense and clear, spiky and crystallized. Then comes the second layer, mellow vanilla-specked frozen yogurt, a supple balm to the intensity before. With these, first there's fizzle, then fade. I may leave the coffee to my husband, but popsicles, those I've got covered. 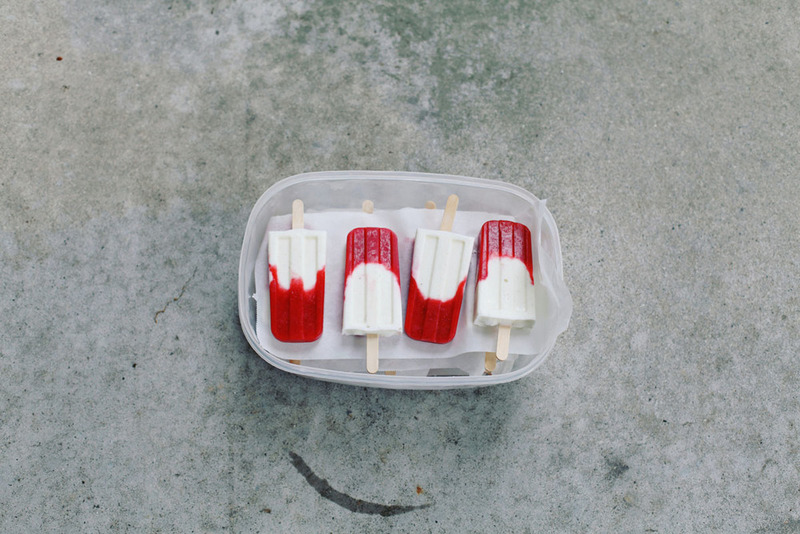 The last time I wrote about ice pops was for UPPERCASE magazine, Issue 10. UPPERCASE is headquartered in Calgary, Alberta, and as you might already know, there has been recent, devastating floods to that region. If you would like more information, I suggest you follow author Julie Van Rosendaal on her site and Twitter; she has been a force through the storm and the recovery and cleanup efforts. For those who would like to donate to the Flood Rebuilding Fund, The Calgary Foundation is doing great work. If you would like to support UPPERCASE, they are having a sale until July 7th, and as products ship through Toronto and Los Angeles, orders are still being filled. To everyone in the effected areas, all the best thoughts and hopes to you. 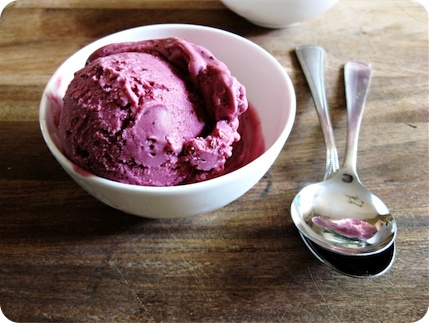 The frozen yogurt comes from the book "The Perfect Scoop" by David Lebovitz (Ten Speed Press, 2007), recipe available via Heidi Swanson, and it is the best one I can imagine. The measurements for the fruit layer are somewhat loosey goosey. Depending on your fruit you might want more or less honey or lime, and you can scale the ratios accordingly. My only warning, it's best to be a miser with the alcohol — you might be able to sneak some more in, but too much will prevent the ice pops from setting properly, and nobody wants a droopy pop. That said, if you want to serve these doused with extra after the fact, go right ahead. Turning out all the ice pops at once frees up your mould for another batch, and means kids can help themselves from the freezer, which is nice. It's helpful to colour the sticks of theirs with permanent marker, so they know which ones to grab. As an aside, these pops were coincidentally patriotic, as this is the Canada Day weekend here. For the upcoming 4th of July or Bastille Day, a streak of blackberry or blueberry could dress them up for your celebrations. Hooray for holidays, pals! In a medium bowl, stir together the strawberries, honey, most of the lime juice and all the zest. Let sit at room temperature for 20-30 minutes, stirring every now and again. Purée the fruit in a blender. Stir in the Campari and taste. It should be punchy, as the flavour will mellow once frozen. Keeping that in mind, add more lime juice or honey as needed. Divide the purée between 10 3-ounce popsicle moulds, rapping the mould on the counter to release any air pockets. Freeze for 15-20 minutes to firm up, or a full hour for a neat delineation between flavours. If you are making the frozen yogurt from scratch, churn while the strawberry layer sets. If you're using store bought, put it in the refrigerator to soften. Spoon the frozen yogurt on top of the strawberry purée. Use a chopstick or extra popsicle stick to release any air bubbles, and swirl the two mixtures, if desired. (Alternatively, the purée and frozen yogurt can be dolloped randomly, without freezing first, which will allow them to marble easily.) Cover and freeze according to manufacturer's instructions. Once frozen, release the solid ice pops by running hot water over the moulds. Store the pops in a sealed, airtight container in the freezer, separating layers with parchment paper.